Both rooms are located on the second floor, next to the billiards and TV area. 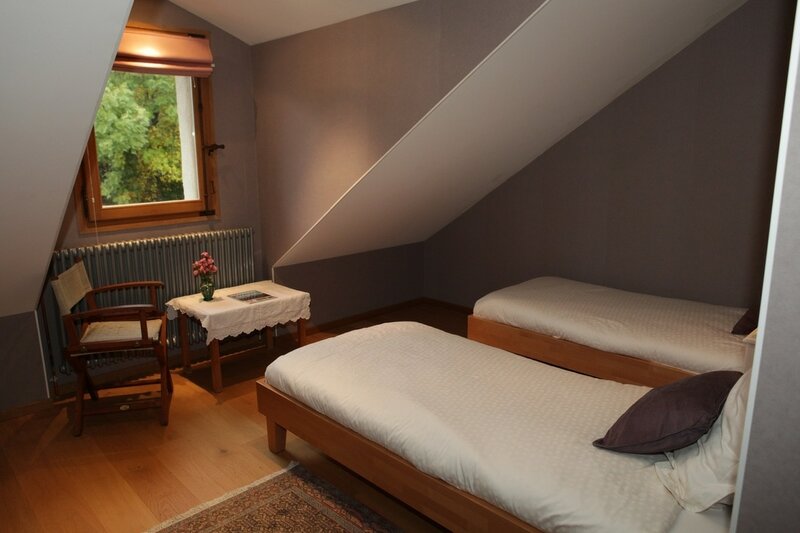 With views of the Vuache mountain, village roofs and church, this cosy room with slanted ceilings is equipped with a double bed (140x195 cm), a small desk, a coffee-table and chair. It has an en-suite bathroom with a lion-foot bath (shower sitting), bathrobes and wc. The floor surface is 25 sqm (usable surface 19 sqm). With views of the garden, hillside and castle ruins, this contemporary room with slanted ceilings offers two single beds or a double bed (160x200 cm). It has a desk and an easy-chair. The en-suite bathroom has a massage shower, towel heater and wc. The floor surface is 26 sqm (usable surface 20 sqm). PLEASE NOTE: Unfortunately our rooms are not suitable for disabled or elderly persons. Pets are not accepted. The whole Manoir is non-smoking. EUR 98 per night, including breakfast and local tax. CHECK-IN: from 4 pm. CHECK-OUT: 11 am. CANCELLATION: Up to 7 days in advance: booking deposit refunded. Less than 7 days in advance: no refund. Use the contact form to tell us your wishes. If the room is available we will ask you for a booking deposit - 50% for bookings over a month ahead or 100% for bookings less than a month ahead. You can pay by PayPal or credit card, or with a French bank cheque.